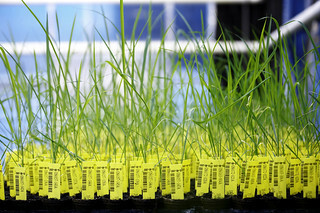 Each genetically modified rice plant in the greenhouses at CropDesign has a barcode and transponder, allowing it to be accurately identified at any time. The rice plants ripen in the greenhouse until they are harvested some of them under ideal conditions. Others are subjected to various stress situations, such as a high salt concentration in the soil or severe drought. Researchers monitor the development of all the plants: they are photographed and measured at regular intervals. The resulting data provide information about the characteristics of the plants and thus about the transported genes. Belgian biotechnology company CropDesign develops Œtraits¹ for the global seed market. A trait is a genetic feature that gives a crop an economically useful characteristic, such as higher yield. Traits are determined by a plant¹s genes. Print free of charge. Copyright by BASF.